There’s been a lot of speculation followed by a little evidence that Freeh was in cahoots with the NCAA. The Paternos et. al. have alleged as much in their lawsuit. I wrote about how the Big Ten and NCAA wanted to collaborate with Freeh, and a statement confirming some sort of relationship by a Penn State attorney. Now, Freeh’s team itself has spoken. Based on discussions that I have had with Omar McNeill, Esq., then a partner of FSS, it is my understanding that FSS provided such updates on a periodic basis throughout the course of the investigation, that such updates related primarily to the process and progress of the investigation and discussions of publicly available information. So there you have it. 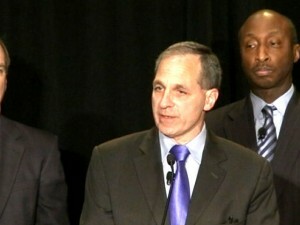 Freeh was regularly feeding the NCAA updates throughout the investigation. I don’t think anybody believes for a second that the discussions were limited to publicly available information, especially since virtually no information was publicly available for most of the investigation. And why would Freeh need to give the NCAA updates about information that was already public knowledge? He wouldn’t. But for now, that’s Penn State’s position. Duly noted, Frank. I’ll take that under advisement.